[137 Pages Report] The global inflation device market is projected to reach USD 600 Million by 2024 from USD 480 Million in 2019, at a CAGR of 4.7% from 2019 to 2024. The rising adoption of minimally invasive procedures, the presence of developed healthcare infrastructure in a majority of developed countries, the growing incidence of CVD, and the less-stringent approval procedures are contributing to the growth of the market. With the growth of the geriatric population, the prevalence of coronary artery disease is also expected to increase, which is a major target indication for interventional cardiology procedures that utilizes inflation device to inflate and deflate the balloon. Aforementioned key factors are likely to fuel growth of market over the forecast period. Based on display type, the inflation device market is segmented into 20ml, 30ml, and 60ml inflation devices. The 60ml inflation devices segment is expected to grow at fastest CAGR during forecast period. These devices feature quick-latch mechanisms (enables one-handed deflation) and are designed to be easy to use, which has driven their adoption in pulmonary, gastroenterology, and otolaryngology procedures, as these procedures utilize comparatively larger-sized balloons and require more amounts of liquid for inflation. Based on application, the inflation device market is segmented interventional cardiology, intervention radiology, peripheral vascular procedures, urological procedures, gastroenterological procedures, and other applications. Among these, the interventional cardiology segment accounted for the largest share of the inflation device market in 2018. The rising geriatric population more prone to develop CVD, which is a major factor driving the adoption of interventional cardiology procedures that utilizes inflation devices. Moreover, growth in the number of new multi-specialty hospitals in developing countries offering advanced minimally invasive procedures, favourable reimbursement scenario for angioplasty procedures will further drive growth of segment over the forecast period. Based on end users, the inflation device market is segmented into hospitals and clinics; and ambulatory care centers. In 2018, the hospitals and clinics segment accounted for the largest market share majorly due to the growing number of hospitals and specialty clinics in emerging countries; increasing prevalence of target diseases; and large number of surgical and diagnostic procedures performed across these facilities. North America is expected to account for largest share in the global inflation device market in 2018. However, APAC is expected to grow at the highest CAGR during the forecast period. This regional segment comprises Japan, China, India, and the Rest of Asia Pacific. 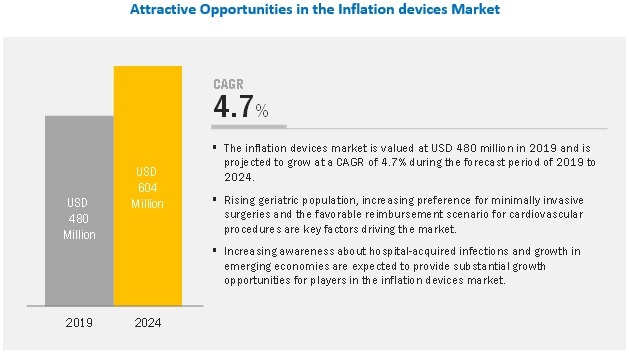 Market growth is driven by the rising number of minimally invasive surgical procedures, developing healthcare infrastructure, rising awareness about HAIs and the use of disposable devices, and the increasing adoption of minimally invasive procedures. 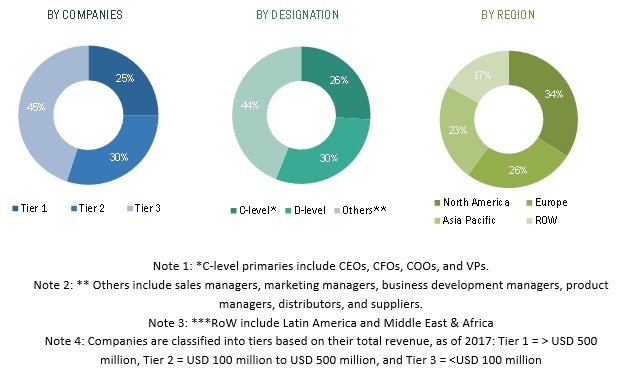 Major market players are undertaking strategic initiatives to increase their presence in emerging APAC countries such as China and India in order to leverage the growth opportunities in these markets will further contribute to the market growth. The major players operating in the inflation device market include Merit Medical Systems (US), Boston Scientific Corporation (US), Cardinal Health (US), CONMED Corporation (US), Medtronic Plc (Ireland), Acclarent Inc. (US), Cook medical (US), Atrion Corporation (US), Becton Dickinson and Company (US), Terumo Medical Corporation (Japan), B. Braun Melsungen AG (US), Olympus Corporation (Japan), Teleflex Incorporated (US), and US Endovascular (US), among others. An analysis of the market developments between 2015 and 2019 revealed that several growth strategies such as product launches and enhancements, partnerships, collaborations, and strategic acquisitions were adopted by market players to strengthen their product portfolios and maintain a competitive position in the inflation device market. Merit Medical Systems (US) is one of the leading players in the global inflation device market. Its broad portfolio of analog and digital inflation device are some key factors accounting for its large share in this market. The company focuses on both organic and inorganic growth strategies to enhance its footprint in the global market. Merit medical is a leading provider of digital inflation technology worldwide. In addition, the company is one of the market leaders in the US for analog inflation devices. With its strong product portfolio and wide geographic presence, the company is expected to grow at a high rate in the market during the forecast period. In 2017, Becton, Dickson and Company (US) has acquired C. R. Bard, Inc. that manufactures medical devices in the fields of urology, vascular, surgical specialty, and oncology. This acquisition expanded BD’s offering in the inflation devices market by the addition of the EAGLE inflation device product. In 2017, Boston Scientific (US) established its new manufacturing facility in Penang, Malaysia. This helped the company expand its presence in the Asia Pacific region and also support local R&D activities. Emerging countries have immense opportunities for the growth and adoption of inflation devices procedures. Will this scenario continue in the next five years? What will be the impact of rising number of local entrants on the market in the coming years? What are the major application areas of inflation devices? What are the potential applications offering growth to inflation devices manufacturers? The study involved four major activities to estimate the current size of the market. Exhaustive secondary research was done to collect information on the market and its different subsegments. The next step was to validate these findings, assumptions, and sizing with industry experts across the value chain through primary research. Both top-down and bottom-up approaches were employed to estimate the complete market size. Thereafter, market breakdown and data triangulation procedures were used to estimate the size of the segments and subsegments. Extensive primary research was conducted after acquiring knowledge about the market scenario through secondary research. A significant number of primary interviews were conducted from both the demand (healthcare providers, research institutes, physicians, and healthcare professionals) and supply sides (developers, manufacturers, and distributors of inflation devices). The primaries interviewed for this study include experts from the inflation devices and minimally invasive devices industry (such as CEOs, VPs, directors, sales heads, and marketing managers of tier 1, 2, and 3 companies engaged in offering inflation devices across the globe) and administrators & purchase managers of hospitals, interventional cardiologist, ambulatory care centers, and healthcare service providers. After arriving at the overall market size of the inflation devices industry from the market estimation approach explained above, the global market was split into several segments and sub-segments. To complete the overall market engineering process and to arrive at the exact market value data, data triangulation and market breakdown methodology methods were employed, wherever applicable. The data was triangulated by studying various factors and trends from both the demand and supply side analysis. To define, describe, and forecast the global market on the basis of display type, capacity, application, and end user, and region. To forecast the revenue of the market segments with respect to five main regions, namely, North America (US and Canada), Europe (Germany, France, the UK, and the Rest of Europe), Asia Pacific (China, Japan, India, and the Rest of Asia Pacific), Rest of World (Latin America, and the Middle East and Africa). To track and analyze competitive developments such as new product launches; agreements, partnerships; mergers & acquisitions; business expansions and research & development activities in the market. North America (US & Canada), Europe (Germany, France, UK, and RoE), APAC (Japan, China, India, and RoAPAC), and ROW (LATAM and MEA). The major players in the market include Merit Medical Systems (US), Boston Scientific Corporation (US), Cardinal Health (US), CONMED Corporation (US), Medtronic plc (Ireland), Acclarent Inc. (US), Cook Medical (US), Atrion Corporation (US), Becton, Dickinson and Company (US), Terumo Medical Corporation (Japan), B. Braun Melsungen AG (US), Olympus Corporation (Japan), Teleflex Incorporated (US), US Endovascular (US), among others. This research report categorizes the market based on Display type, Capacity, Application, End User, and Region.